Description: Pembroke. A fine map of the county from the second edition of Speed's seminal atlas, 'The Theatre of Great Britaine'. Vignette of Pembroke. Description: Coloured county map engraved by Kip but sourced from George Owen. Description: Pembrokeshire. Striking map of the county decorated with a cartouche of putti, and a series of resident family crests. Coloured. 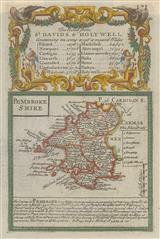 Description: Pembroke, a rich and detailed county map. Original colour. Description: Fine chart of Milford Haven in Pembrokeshire as far as Haverford with a large dedication to Henry, Duke of Beaufort. Description: County map of Pembrokshire. Original hand-colour. 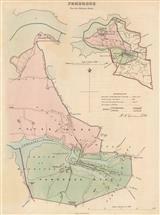 Description: Town plan of Pembroke with colour coded reference to its wards and boroughs. Original colour.